It looks like you are visiting us from . Would you like to be taken to our UK website? Thanks for contacting us. We aim to respond the same business day (M - F 7:30 - 17:00). If your request is time sensitive, please call us at 02037 697 073. All prices displayed in a currency other than Euro are for reference only. The currency displayed at checkout will always be Euro. What is an In-Vehicle Computer? What are the Defining Features of an In-Vehicle Computer? As the transportation industry continues to evolve, it's increasingly common to find computer systems serving a wide range of uses within cars, trucks, trains, boats and airplanes. 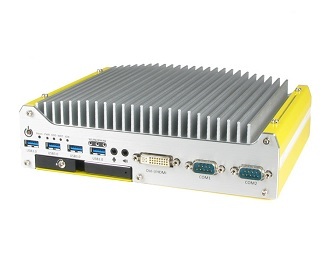 The number of transportation applications for embedded PCs has grown exponentially, encompassing everything from advanced navigation and fleet management, to cargo allocation, telematics and infotainment. PCs used within vehicles must meet a very specific set of standards to ensure reliability in the often challenging environments of mobile installations. Computers for transportation applications will almost always include various combinations of these features. Automotive Power Features - Specially designed automotive power supplies are commonly used for in-vehicle computers in order to account for the fluctuating power associated with turning a vehicle on and off. These PSUs feature settings that allow the user to customize the timing and voltage of power delivered to the PC based on the ignition state of the vehicle, often referred to as "ignition sensing". Because of the unique challenges of in-vehicle computing, there are a number of other features commonly found in these systems that might not be as familiar to industrial & embedded PC users. Additional connectivity, often via CAN Bus, is frequently required to interface with existing automotive or mobile systems. In many instances cellular 4G LTE cards are installed to enable wireless communication and data transfer from vehicles to centralized servers. Wide input power supplies are also commonly required to account for voltage fluctuations. Logic Supply offers Free Economy Shipping within the Netherlands, Germany and Belgium on all online orders of €200 and above. If your purchase qualifies for Free Economy Shipping, you will see this option available at the time of checkout. For American customers, we have a website and store located in the United States at www.logicsupply.com/. If there is something you don't see on the American site, please contact info@logicsupply.co.uk.